Two no-confidence motions were lodged against Jardim's Government in the Madeira Regional Parliament by the Socialist Party and the Labour Party. In response the PSD proposed a motion of confidence, which was voted on Tuesday. 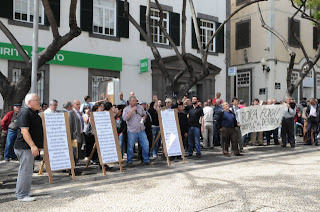 The debate of the motion was marked by protests outside the Parliament, calling for Jardim to step down and be put on trial for hiding the debt - among other things. The protestors stayed from 9 am to 2pm, when the session finally ended. Jardim, rather pathetically left his car and chauffeur outside the front door as a decoy and then scuttled out the back door in order not to face the protests. This is the second anti-jardim protest in as many weeks, since the anti-troika protest held ten days earlier turned into a protest against the local government. The crowd detoured from the original protest path, ending up outside Quinta Vigia, the seat of Government, where they called for an end to Jardim's rule. Jardim's vote of confidence was voted through in an open show of hands by his own party, which enjoys a marginal absolute majority. All the opposition voted against. The longer Jardim clings to power, however, the more explosive the social situation becomes, and he has to traipse around surronded by police and bodyguards.